In the Marines, special communications signals collection analysts use every phase of communications to intercept and interpret signals that can be turned into intelligence against enemy forces. It's a highly technical job that requires a fair amount of specialized training and a good deal of patience to be successful. But it's a job that's crucial to the Marine Corps' intelligence gathering operations. This job is open to Marines between the ranks of private and gunnery sergeant. It's considered a primary military occupational specialty (MOS) and is categorized as MOS 2621. These Marines plan, coordinate and determine the location and any logistical needs for setting up operational antenna fields. They oversee the installation, operation, and maintenance of the required equipment and facilities. MOS 2621 must perform communications electronic signals search missions, record the intercept of signals using electronic means and measure, classify and evaluate the signals. Before they begin work in this job, these Marines must be familiar with communications intercept receivers, specialized computer hardware and software programs, and wideband converters. They'll use these in the process of collecting, recording, analyzing and supporting computerized network operations missions and reporting on a wide variety of intercepted communications signals. Secondary duties and tasks involve aspects of transmission security (TRANSEC), communications security (COMSEC), and direction-finding (DF) operations. 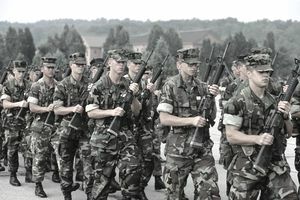 All Marines complete basic training (otherwise known as boot camp) either at Recruit Training Depot in Parris Island, South Carolina or in San Diego, California. After boot camp, Marines assigned to MOS 2621 take courses at the Marine Detachments at Naval Air Station Corry Station in Pensacola Florida, and Goodfellow Air Force Base in San Angelo, Texas. Marines assigned MOS 2621 will receive training in power supply operations, equipment prime mover operations, and vehicle maintenance procedures. The duties and task for MOS 2621 increase at the rank of sergeant and above and will include encompassing communications intelligence analysis and product reporting along supervisory tasks related to intelligence gatherings and functions. This MOS will be assigned and voided only by the authority of the Commandant of the Marine Corps. Prior to, or in conjunction with being promoted to sergeant, Marines will receive formal schooling in signals/traffic analysis and reporting procedures. To be eligible for this job, you need a score of at least 100 on the general technical (GT) section of the Armed Services Vocational Aptitude Battery (ASVAB) tests. Since you're handling highly sensitive information in this job, you'll also have to be eligible for a top-secret security clearance from the Department of Defense. This involves an extensive background check of your finances and character, and a history of drug or alcohol abuse may be disqualifying. Candidates for this job also must be eligible for access to Sensitive Compartmented Information (SCI) based on a Single Scope Background Investigation (SSBI). You also have to complete the Communications Signals Collection and Processing Course and must be a U.S. citizen.